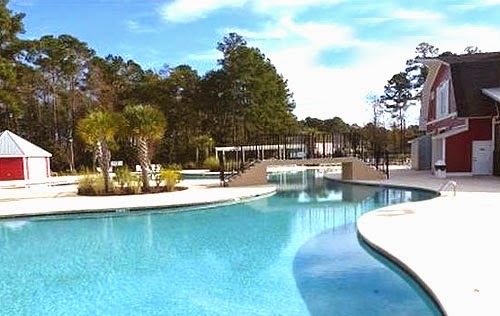 One of the favorite new communities in the Myrtle Beach area is Carolina Forest. Far enough out of Myrtle Beach to be extremely affordable and close enough to enjoy all of the great dining, shopping, night clubs, live shows and, of course, the beaches, it offers the best of both worlds. With its own high school, middle school and elementary schools, the 9000 acre landscaped community is practically a city on its own, boasting its own little shopping center and a business community of doctors, dentists and other professionals. 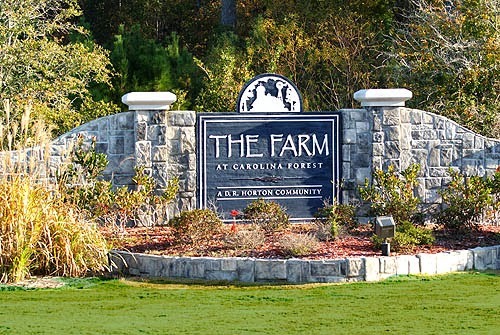 Beautiful and unique, The Farm is a popular neighborhood within Carolina Forest with a “down on the farm” theme. The clubhouse has been creatively designed to resemble a big red barn, gazebos and gardens throughout the neighborhood continue the theme and there is a large common area for social events to promote neighborly interaction. Streets feature names like Planters Row Way, Barn Owl Court and Red Rooster lane. Amenities are many in this family-oriented community. Wide sidewalks and bike paths, a playground and a special kiddie pool assure your children will always be entertained. Adults will appreciate the 8000 square foot swimming pool, the fitness center and clubhouse. 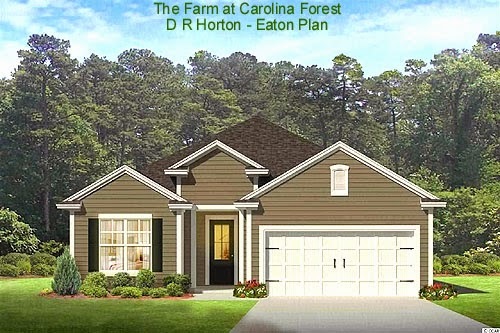 Featuring a mix of homes, condos and townhouses, The Farm is mostly single family homes by D R Horton which offer a number of new home floor plans with 3-5 bedrooms ranging in price from the mid $100,000 to over $300,000 for more spacious homes with larger lots. You will love the family friendly atmosphere and the charm of this neighborhood so call us today. Let us take you on a tour of the beautiful homes for sale at the Farm in Carolina Forest.